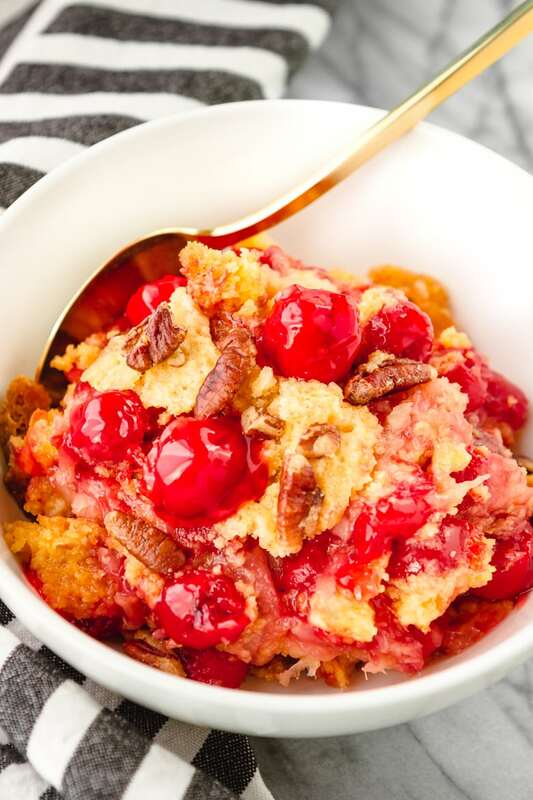 With just 5 ingredients, this super easy cherry dump cake recipe is sure to become your go-to dessert for cookouts, potlucks, and every other occasion… Just dump, spread, sprinkle, dot, and bake! Right now you might be wondering, “What is a dump cake”? Well, hold on to your butts (as my 10-year-old would say), because I’m about to rock your world with what is genuinely one of the simplest desserts on the planet. Okay, so I’ll admit dump cake is not the most appetizing name, and it’s true they’re probably not going to win any awards for beauty. At their most basic, dump cakes are nothing more than a box of cake mix with some fruit filling. 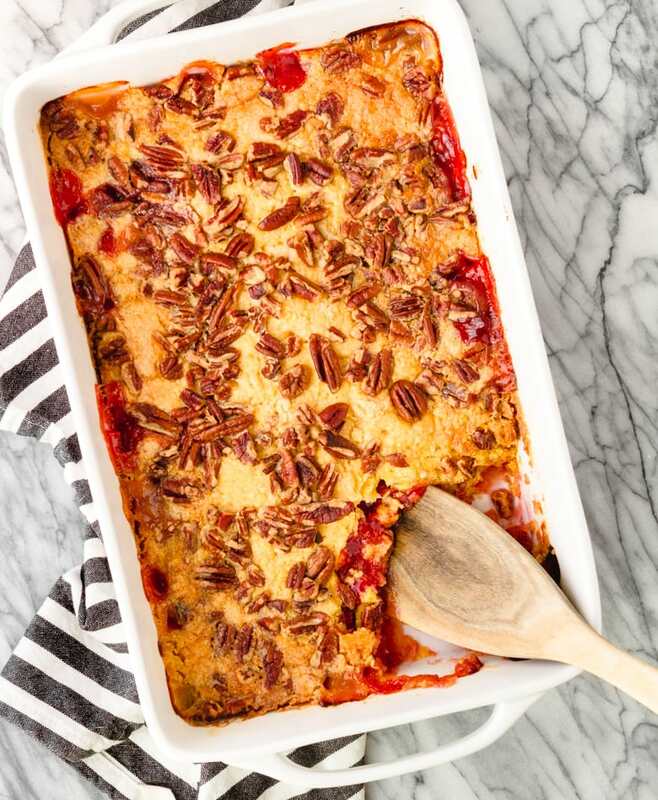 In fact, this particular cherry pineapple dump cake recipe only calls for 5 ingredients: boxed cake mix, a can of cherry pie filling, a can of crushed pineapple, butter, and chopped pecans. In fact, you may even have all of these ingredients in your pantry right now! Really, the most thought you’ll have to put into this recipe is in choosing which cake mix to use. My recommendation? 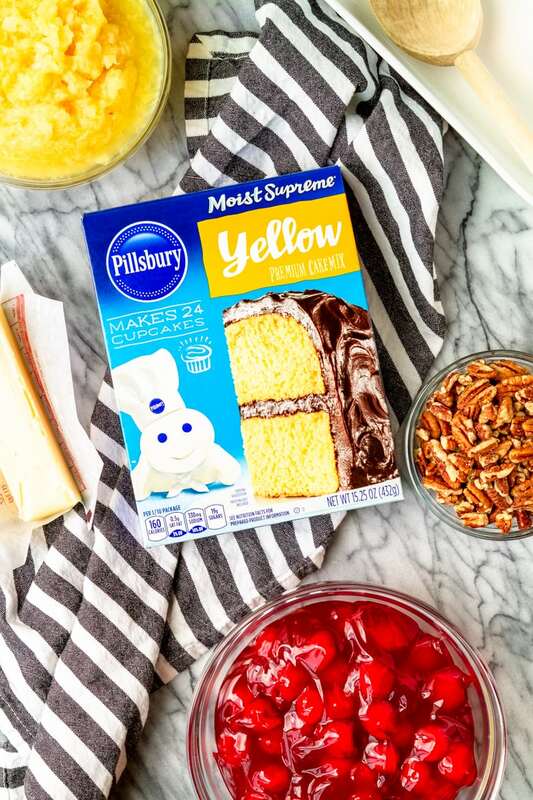 Pillsbury™ Moist Supreme Yellow Premium Cake Mix — you can find it easily in the baking aisle of just about every grocery store (picked mine up at Kroger! ), and I know I can count on it for consistent results in all of my dump cake recipes. Beyond that, you just dump the ingredients into a pan, spread, and bake. Can it get any easier than that?! I mean, the oven does all of the work for you. This pineapple cherry dump cake just might be the very first cake I ever made on my own. My grandma brought the recipe home from her “club” and walked me through it once. From then on, I made it pretty much weekly when we stayed at her house on Friday nights. And don’t ask me what her club was all about, because I have absolutely no idea what they did there, LOL. Played cards maybe? Start by buttering your cake pan or baking dish. Then dump the crushed pineapple in and spread. Next dump the cherry pie filling in and spread. Finally, dump the boxed cake mix over the top and spread. Are you sensing a theme here? DUMP cake! Dot slices of butter all over the top, sprinkle on the chopped pecans, and bake, bake baby. Expect your house to smell AMAZING and that, one by one (if they didn’t help), your kids will come out of hibernation in their rooms to ask what you’re making. At least that’s what went down here yesterday! Dump Cakes For The Win! So what do you think? TOTAL crowd pleaser — am I right?! This cherry dump cake has everything going for it: it’s easy-peasy, delicious, and it travels well, which makes it ideal for summer cookouts and potlucks. Serve it hot, warm, cold, or with a scoop of ice cream even. The one constant? The dish will most definitely be scraped clean… So don’t plan on leftovers! PIN IT NOW! CLICK HERE TO ADD THIS PERFECT INSTANT POT SWEET POTATOES RECIPE TO YOUR EASY DESSERT RECIPES BOARD ON PINTEREST! 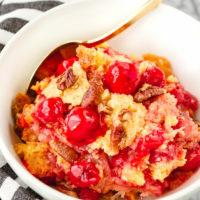 With just 5 ingredients, this super easy cherry dump cake recipe is sure to become your go-to dessert for cookouts, potlucks, and every other occasion... Just dump, spread, sprinkle, dot, and bake! Preheat your oven to 350 degrees. Grease a 13x9-inch cake pan or baking dish with butter. Dump the undrained crushed pineapple into the pan, and spread evenly across the bottom. Dump in the cherry pie filling and spread evenly over the pineapple. Dump the dry cake mix on top of the pineapple and cherry layers, and spread evenly. Dot the squares of butter all over the cake mix layer. Then sprinkle with chopped pecans. Bake at 350 degrees for 48-53 minutes, until bubbly and golden brown around the edges. Serve hot, warm, or cold, with or without a scoop of vanilla ice cream. Birthday Cake Cookies — These festive and fun sandwich cookies start with yellow cake mix and a whole lotta sprinkles! Boston Cream Pie Cake — This angel food cake layered with vanilla pudding and covered in chocolate ganache is always a HUGE crowd pleaser! Banana Split Cake — Cover a classic strawberry poke cake with vanilla pudding, whipped cream, and a cherry on top for a delicious take on the always popular ice cream dessert! 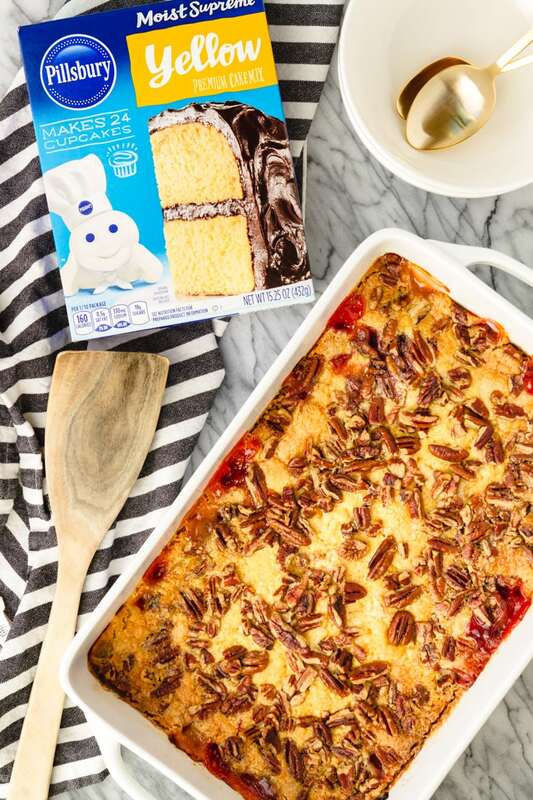 Find more inspiration for “out-of-the-box” ways to use Pillsbury cake mixes on Myxxrecipes.com! I’d love to see how your cherry dump cake turns out… Tag me @Unsophisticook on Instagram or use the hashtag #Unsophisticook so I can check it out. Enjoy! Yummmm I absolutely can’t wait to make this! Pineapple is my favorite during the summer! this looks fantastic! The bright color from the cherries make this look amazing and flavorful! Dump cakes are my love language! This looks so easy! Yes please! This is so my kind of recipe – easy and delicious! Plus I love that there aren’t any fussy steps, just dump and go! Can’t wait to try it! Doesn’t get any easier than this! Love it! This looks so easy and delicious!! Oh, dump cakes are my favourite, and there’s so much you can do with them. I don’t think I’ve ever seen one with nuts before, but cherry and pineapple is a perfect combination. I LOVE how easy and delicious this is! Good idea! Looks very tasty! I am going to make this! This recipe really impresses! I really like! Thank you!!! 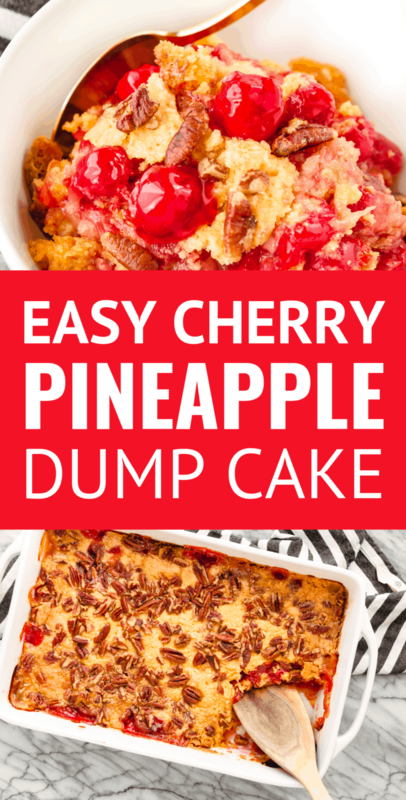 Love how easy dump cakes are to make! This looks heavenly and hard to believe only 5 ingredients! This takes me back. Love the simple, delicious recipe! These cakes have always fascinated me, but I’ve never had the guts to try one. I love cake mixes, they have the best texture…I think I’m finally going to take the plunge and try this, love the flavors!